While hackneyed hot spots consisting of Bourbon Street, Jackson Square and Cafe Du Monde are favorites in the Big Easy, you have to saunter to the uncharted side of New Orleans to see the authentic city and escape the drunken crowds. With a little NOLA native advice, you will begin to discover local art and artists, an urban farm home to pygmy goats and cuisine that transmits the essence of New Orleans. Situated across the street from Central City BBQ, this urban farm cultivates produce for local restaurants while occasionally hosting events like their Concert Series and Pizza & Pies. Jimmy Seely and Joel Hitchcock Tilton began Paradigm Gardens as a community garden on Delachaise Street. The community garden turned into a larger operation when they began supplying to restaurants, and then transformed into Paradigm Gardens. The community’s involvement helped propagate the garden until it was ready to provide fresh ingredients. Specialty produce is provided to Patois, Coquette and Primitive, Paradigm Garden’s member restaurants. Everything from turnips to scallions, summer squash to watermelon, mustard greens to pea shoots and mint can be found growing in the garden sometime throughout the year. Along with the harvest and events, the farm is home to chickens, bees and three goats: AJ and the pygmy pair Oatmeal and Raisin. New Orleans has a large and vast community of artists who want to showcase their pieces. However, it was never easy to coordinate, until Collin Ferguson and Catherine Todd co-founded Where Y’Art, a business where art and artists are easily approachable and available. Where Y’Art creates a direct path to the art and artists in NOLA’s community. As well as a home location on Royal Street, a cyber art gallery is available where individuals can meet the artists, browse collections and purchase pieces. Every two months, the collections are changed to showcase a new artist and keep visitors guessing. A funky, casual coffeehouse, Satsuma opened in 2009 with the hopes of providing fresh juices along with breakfast and lunch items to the community. Exclusive juices prepared at Satsuma include their ABC with apples, beets, carrots and lemons; the Popeye with spinach, lemons, kale and apples; and the Calcium Injection including cucumbers, kales, celery, lemons, ginger and parsley. Peter and Cassi Dymond, the owners, wanted to bring a healthier eatery option to New Orleans where customers didn’t have to guess what ingredients were used in their food. A Green Sandwich with one egg, baby arugula, tomato, avocado mash and swiss on your choice of bread is what you can expect at the cozy establishment with artwork along the walls and even under your feet. Chef Nina Compton’s menu at Compère Lapin, located in The Old No. 77 Hotel and Chandlery, is inspired by the trickster rabbit in a Caribbean folk tale, Compere Lapin, which chef Compton read during her childhood. Saturating the menu with New Orlean’s culinary heritage, Compton also taps into her French culinary training to create dishes pleasing to the palate. Roughly translating to “the brother rabbit,” Compère Lapin strives to be more than just a place to eat; Compton encourages her customers to appreciate the time spent with one another while sharing memories around the table enjoying the savory dishes. Conch Croquettes, Half Chicken with broccoli rabe and the Caribbean Seafood Pepper Pot are just some of the dishes on offer at Compère Lapin. Mignon Faget began her design career in 1969 with the launch of her first ready-to-wear clothing collection. With the success of her clothing collection, the New Orleans native began thinking of what could enhance her clothes—pins, belts, necklaces. Faget’s collections represent NOLA’s culture and environment without sacrificing elegance. Her pieces feature indigenous New Orlean’s materials. Collections include the Fleur Dis Lis, which is a symbol of survival and of the city of New Orleans; and the Mardi Gras collection featuring mask pendants, voodoo dolls and crown jeweled pieces. Willa Jean, a restaurant and bakery with Southern charm, was created by chef Kelly Fields out of a partnership with chef John Besh. 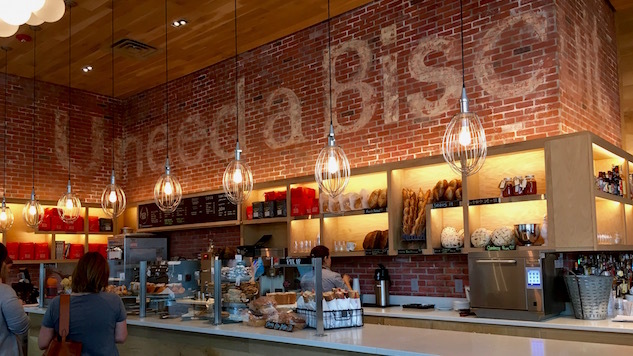 The modern contemporary restaurant is complete with Edison lightbulbs and a mural stating, “U Need A Biscuit,” above the bakery that features housemade breads and pastries. Named after chef/partner Fields’ grandmother who inspired her to follow her passion, the restaurant offers snacks, biscuits, hot plates, sandwiches and desserts. For breakfast, the Willa Jean Shrimp + Grits pairs perfectly with their macchiato served with a shot of soda water to cut down on the bitterness and enhance the richness of the drink. As for later in the evening, the Beef Short Rib is great with the eatery’s Creamsicle, a Cathead honeysuckle vodka slushy. This 1,300-acre park full of gardens, golf courses, amusement park rides and disc golf courses is one of the oldest urban parks in the country, having opened in 1854. Between strolling along the Botanical Garden and the Big Lake, a must-stop is Morning Call Coffee Stand, the 142-year-old coffee and beignet spot ideal for a quick pick-me-up. Morning Call opened its newest location in City Park in 2012. As well as serving beignets and your choice of a classic or frozen cafe au lait 24-hours a day, the outpost also serves gumbo, jambalaya and ice cream. Morning Call only takes cash so don’t leave home without some. It may not have a famed rotating carousel bar, but the original building did have a Subway sandwich shop. But the highlight of The Moxy, which was perviously home to a Holiday Inn as well as a Subway, is not in its storied past. The space is bursting with a bold contemporary theme. The Moxy has 108 rooms complete with inflatable alligators and pillows displaying the phrase “I Woke Up Like This,” and an energetic industrial-chic common room with an assortment of games such as Cards Against Humanity and a giant Jenga. If you’re more of an introvert, curl up with a book while sipping on their signature Got Moxy made of Bacardi Cherry Rum and fresh lime.